The present lot displays some influence from Mughal jades which entered the Qing court in considerable numbers during Emperor Qianlong's reign. These jades were held in high regard by the emperor who ordered Chinese jade lapidaries to copy exactly certain of these foreign jades or to produce Chinese objects in Mughal style. The Mughal style of embellishment is seen on the present pair of horses whose eyes are inlaid with ruby beads, something that is very rarely found on Chinese jade carvings of animals. The only comparable example is a small jade hare similarly embellished with ruby eyes, illustrated in Zhongguo Yuqi Quanji, vol. 6, no. 271. 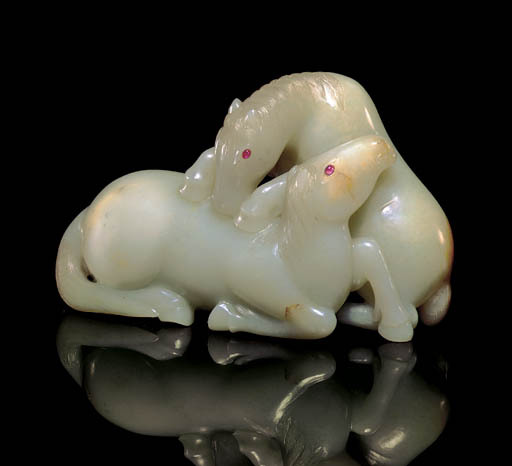 It is also very rare to find a pair of horses carved in jade, as most examples only feature single animals. Compare with two other pairs of horses, one in the Palace Museum, Beijing, illustrated in Jadeware (III), The Complete Collection of Treasures of the Palace Museum, Hong Kong, 1995, pl. 89 (fig. 1); and the other, inscribed with a Qianlong seal mark, sold in these Rooms, 20 March 1990, lot 917, and again, The Imperial Sale, 28 April 1996, lot 9. The present pair of horses is rendered in an exceptionally naturalistic manner and the composition appears to be unique, with one horse grooming the other in a very tender way.